Why You Should Do a Sleep Test: At Home or In-Center | Advanced Sleep Medicine Services, Inc. Many who suspect they have sleep apnea don’t seek treatment due to common misconceptions about what a diagnoses entails. With either choice, it is a simple test. It records your pulse, breathing, movement and oxygen levels. The two different tests a person can choose from are either an at home test or an in-center test. Your sleep care team will gather the results as a sleep expert analyzes and determines whether or not you have sleep apnea. They will also be able to decide if you have mild, moderate or severe. Before a decision is made on which test is best for you, here’s everything you need to know. This test is a comfortable option, as it takes place in your own home. You are given specific instructions on how to utilize the sleep tools. The machine will record your sleeping patterns while you sleep in your own bed with your normal routine. Many like this option because they feel like it takes less time and they feel more comfortable handling it on their own without anyone watching live. Although an at home test might sound like a simpler choice, it is not for everybody and it is not always simple. It’s important that your doctor suspects you have mild to severe obstructive sleep apnea. It’s also important that you be in good or average health. If you suspect you may have OSA and would like to consider a test, it must still be prescribed by a doctor. If the ability to set up equipment independently is a struggle or you have any of these conditions, you may want to consider a sleep center. This is because these conditions may cause a distortion in the results. Heart Disease Obstructive sleep apnea is associated with heart disease. The connection between the two can cause a discrepancy in the data of an at home test because of its impact on the respiratory system. It’s important to be able to control this, which is impossible at an at home test. COPD This stands for chronic pulmonary disease. It could be in the form of chronic bronchitis or emphysema. 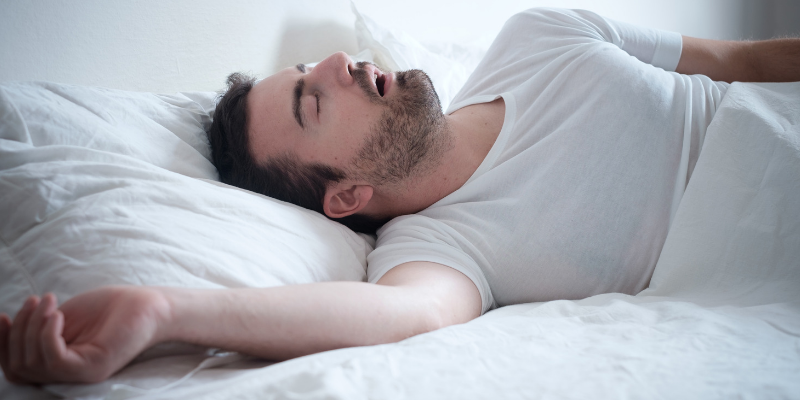 COPD and sleep apnea are not connected, but they can both impact sleep. An at home test monitors breathing, not actual sleep. Obesity OSA is more likely to occur in obese persons. While it is great news that losing weight may decrease sleep apnea symptoms , for the purposes of the study, there is more that will need to be monitored beyond breathing. OHS This stands for obesity hypoventilation syndrome. It is a breathing disorder that impacts those with obesity. This means that a person has an excess of carbon dioxide in their blood and not the sufficient amount of oxygen needed for the body to function properly. CPAP therapy may help with this, but it’s important to meet with a physician for discussion. Neuromuscular Disease This impacts your entire neuromuscular system. Coincidentally, OSA is impacted by the muscles in the throat. Degenerative Neurological Conditions There are many different kinds of degenerative neurological conditions. It can be Alzheimer’s, Huntington’s and Parkinson’s Disease. It is best to have a care team aligned to assist you in making sure the sleep study is done correctly in the lab. You are a good candidate for an at home test if you are in reasonable health. They are typically lower in cost due to the fact that they are screening for much less . If you are extremely uncomfortable sleeping outside of your own home, the home test may be right for you. Think clearly about the problem you are trying to solve and what you are willing to do in order to find a solution towards optimal health. An in-center test is going to give the most robust information. An at home test monitors breathing patterns, but cannot analyze anything more. “In-center sleep apnea tests can help you see seizures or PLMS. You can’t see this with a home study. In-center sleep tests are still a gold standard, but a home study can be done to rule out sleep apnea as a screening tool. In-center sleep tests are beneficial as you can get a fixed pressure CPAP, if prescribed to you after the test. This is only attainable with an in-center sleep test. You can only get an automatic CPAP with a home sleep study, not a fixed pressure CPAP,” Dr. Mostafavi. To make the most out of a sleep study, it’s important to make everything as similar to a typical night time routine. This means you should take normal pajamas, medications, toiletries and should have already eaten a typical dinner meal. The goal is for you to be asleep for 7 hours, but don’t stress about that number, as even a few hours of monitoring can provide a lot of information. Do not be afraid to ask questions to the sleep technologist. Depending on what test you are in for, you will be able to go home shortly after your first night. A diagnosis will be made by the attending physician and sent onto your doctor to discuss the results. It’s really that easy! Will I have the results from the at home test sooner than the ones from the test center? Because there is less to analyze, you may get your results sooner. However, this is dependent on a few factors, like if you are mailing the machine back and the workload of each sleep clinic. After analyzing results and diagnosing, the results will be sent to your doctor in 7-10 days. What happens if I have sleep apnea? When your doctor gets the results of the study back, they will tell you the proper course of action based on the findings. Likely, if you do have sleep apnea, CPAP therapy will be recommended, as this has been proven to be the most helpful and least invasive form of treatment. There are also other options such as a mouthpiece and as a last resort, surgery. Should I take my medicine before the sleep study? Your routine, whether at home or in the sleep center, should be the same. If there is a medication you should not take, your doctor will discuss this with you prior to the study. Can I go to the bathroom at night? You can go to the bathroom whenever you need to. At home, you will simply remove the sensors and place them back on once you get to bed. At the sleep center, you will call for a technician to remove all wiring and then you are free to go as you please. They will reconnect you upon your return to bed. An in-center sleep test can help you diagnose more than sleep apnea! Contact us today to schedule your appointment – we’re here to help you. Jean-Louis G, Zizi F, Clark LT, Brown CD, McFarlane SI. Obstructive sleep apnea and cardiovascular disease: Role of the metabolic syndrome and its components. J Clin Sleep Med. 2008;4(3):261–72. Warner, Jennifer. “Weight Loss Helps Sleep Apnea.” WebMD, WebMD, 28 Sept. 2009, www.webmd.com/sleep-disorders/sleep-apnea/news/20090928/weight-loss-helps-sleep-apnea. Kim RD, Kapur VK, Redline-Bruch J, Rueschman M, Auckley DH, Benca RM, Foldvary-Schafer NR, Iber C, Zee PC, Rosen CL, Redline S, Ramsey SD. An economic evaluation of home versus laboratory-based diagnosis of obstructive sleep apnea. SLEEP 2015;38(7):1027–1037.